In 1998 Google decided to use the links from other websites as another factor in determining whether the site was a good match for a search. Each link to a site was a vote for the site, and the more votes the site received, the better a site was regarded by Google. 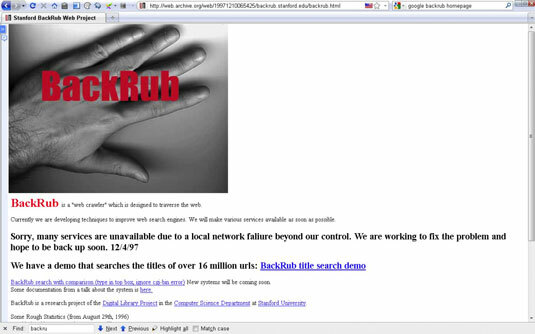 1996: Larry and Sergey, now Stanford computer science grad students, begin collaborating on a search engine called BackRub. 1997: Larry and Sergey decide that the BackRub search engine needs a new name. After some brainstorming, they go with Google. So there you have it. Google was revolutionary because of the weight given to links. Google changed the game totally, and now all the major search engines look at links to learn about the referenced pages. Links make it easier for search engines to find the page. As the searchbots travel around the web, they follow links. They index a page, follow the links on that page to other pages, index those pages, follow the links on those pages, and so on. The more links to a page, the more likely the page is picked up and indexed by search engines, and the more quickly it happens. Search engines use the number of links pointing to a page as an indication of the page’s value. If lots of pages link to your page, search engines place a greater value on your page than pages with few links pointing to them. Links provide information to search engines about the page they’re pointing to. The link text often contains keywords that search engines can use to glean additional information about your page. The theme of the site pointing to your site may also give search engines an indication of your site’s theme. For example, if you have links from hundreds of rodent-related web sites, and those links have rodent-related keywords in them, it’s a good bet that your site has something to do with rodents. Links not only bring searchbots to a page, but may also bring people to the page. The whole purpose of your search engine campaign is to bring people to your site, right? Sometimes people will actually click the links and arrive at your site; people often forget that in the SEO world! Links are very important. Sometimes they mean the difference between being indexed by a search engine and not being indexed, or between being ranked well in a search engine and barely being ranked at all. Backlinks are an integral part of the optimization of your website. A backlink — this may surprise you — is a link back to your site. Search engines look at backlinks to figure out what your site is about and how important it is. Links aren’t something detached from your site; they’re an integral part of your site. Think of your website in terms of a regional map. Your site is the major city, and backlinks are the roads bringing traffic into the city. A geographer looking at the map wouldn’t regard the city and roads as separate entities; they’re all part of the same economic and social system. So don’t think of the links pointing to your site as something “out there” — they’re a critical part of your site. Search engines are trying to figure out what site or page is the best match for a search. Search engines use links as one way to determine this. As with content though, using the number of links to and from a site to measure significance is an imperfect method. A page can conceivably be the best page on a particular subject, yet have few links to it. Search engines have difficulty figuring out what the searcher needs, so they have to use what information is available to them. Using links is a way of recruiting website owners to help point out useful sites and pages. The strategy is imperfect, but that’s the search engine world you’re living in.